Another year, another brilliant Essen Spiel. While the ever-encroaching dominance of Asmodee continued, taking over new swathes of the larger halls, there were still plenty of great games – from publishers large and small – to get your hands on. I had a mixed time getting hold of review copies, but i’m really happy with the crop I came home with. I filled two suitcases, which was a real pain to travel back with – but I managed without any embarrassing incidents and without having to ask anyone to mule anything home for me! They’re even all punched and ready to go. It’s looking similar to last year in terms of review work load, with about 15 titles sitting in my games room waiting to be played; I’ll list them below and try to update this post with links as I get them done. But first I’ll talk briefly about the ones I missed out on, before finishing with some other thoughts about my trip to the show. Only four of my Top 10 most wanted titles failed to come home with me. 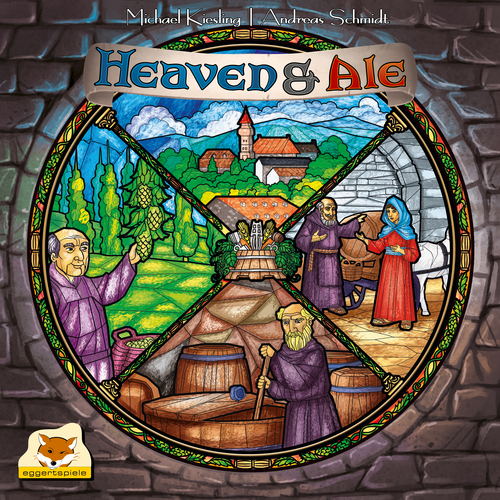 I got to play Heaven & Ale and, while it was a solid game, it failed to really set my heart racing. I’d happily play again, but while I enjoyed the Egizia-style action selection mechanism I just kept thinking, I’d rather be playing Egizia. I was sorry to miss out on Rajas of the Ganges. Huch! didn’t want to deal with me, despite me having done long and well received reviews of Ulm and Touria last year. But on the plus side I know a few people who bought it, so if it’s a real cracker I may purchase/review it later. And this isn’t sour grapes – it’s purely financial. I can only review so much, so am always going to go for titles I can get a discount on. I’ll pay full price on games I love, but there are just so many games. Similarly with Heldentaufe, the publisher wasn’t giving out any more review copies. In this case it made perfect sense, as they were just at Essen to shift their final copies and had no plans to print more. I still hope to play it one day though, so will keep my eye out on the trade/secondhand market next year. Poor old Renegade had a nightmare, as none of their games arrived until Friday. By then I was pretty much full, and they were super busy, so didn’t follow up on my interest for Ex Libris. From my ‘best of the rest’ list, Altiplano sold out; while demos of Whistle Stop, Clans of Caledonia, Otys, Chimera Station and Dragonsgate College put me off just enough to stop them moving from wishlist to suitcase. I’m still super interested in playing Bärenpark but know people who have it; while the game I’m probably most annoyed about not trying was Wendake. By the time we saw a space on the demo tables I was totally gamed out on Sunday, so walked away. Hopefully someone I know picked it up. Also expect Hanamikoji and the new Ancient Terrible Things mini expansion to be covered soon. * I can assure you this won’t affect my reviews of the games; but if any don’t make it onto the site, it’s because I didn’t like the game enough to play it the requisite four to five times to make me feel I’ve played it enough to review. I had some really great nights out gaming in both Hotel Motel One and Holiday Inn (cue ‘Rappers Delight’); two of the few hotels I’m yet to stay at in Essen – thanks to the largely Danish contingent who were such a laugh to play and chat with into the small hours. Thanks guys! 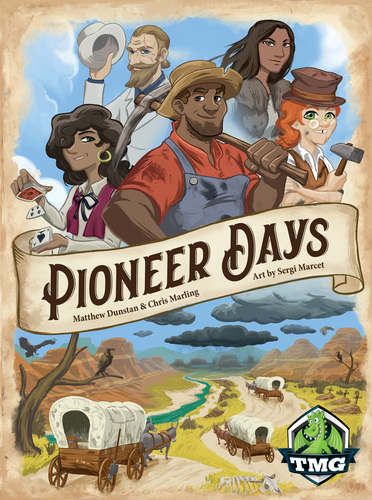 It was fun signing copies of Pioneer Days, both in the hotel and on the TMG stand on Friday. They rushed 150 copies over by air and, once a panic about no dice arriving was averted, it was great to get a copy of the finished product. They’ve done a beautiful production job on it. Myself and David Thompson had some really productive meetings with publishers too. I still can’t quite believe it when walking into a meeting with the likes of Kosmos, Ravensburger, or Hans Im Gluck – I just sit there thinking about the ridiculously famous games my little designs would be sitting alongside if they decided to publish one of them. Not sure I’m ever going to get used to that kind of thing; but who knows what the future holds? And with the dates for Essen Spiel 2018 already confirmed (October 25-28), all that’s left is to start planning for next year. If things go to plan they’ll be a new game from me at the show then too, with another aimed for 2019. Bring it on! We have Wendake over here! Cool – let me know how it plays!